Though many women are going under the knife these days, plastic surgery isn’t for everyone. 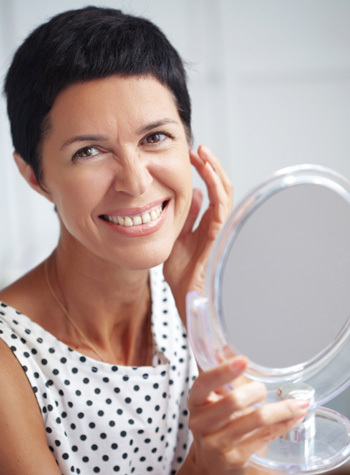 Forgoing surgery doesn’t mean you have to give in to crow’s feet, dull skin and emerging wrinkles. Check out this makeup advice from the pros for a younger look. Celebrity stylist Gad Cohen provides a variety of fabulous tips for a younger-looking you. You can learn more about Gad and the list of stars with whom he’s worked throughout his illustrious career on his website, www.gadcohen.com. Moisturize! Keeping your skin moisturized is essential to minimizing the appearance for fine lines and wrinkles. Plus, the moisture helps makeup slide on evenly. Use a foundation that not only covers, but also hydrates the skin without creating a mask. As we mature, skin tones become uneven, so look for translucent coverage. Apply foundations with your fingers, not a sponge, and don’t forget your neck: It’s attached! If your eyes are your biggest asset, play them up with creamy shadows in gray/charcoal tones (blend with the fingers for a smoky look). Add a bit of liner at the base of the lashes — don’t forget to curl them — and then apply a good-quality black mascara. Do eyes first to avoid messing up your foundation with smudges, and you won’t need as much concealer. Get rid of dark circles with a yellow-based concealer. La Prairie has several concealers for different skin types. Use creamy blush (no powders) — and only on the apples of the cheeks. For mature skin, apply a light dusting of Guerlain bronzer for contour and a finished glow — but avoid iridescence and sparkles. The finishing touch: lips! For thin lips, use a bit more color; for symmetrical/full lips, use a pencil to keep the lipstick from bleeding. For a sheer look, use the same color pencil as your lip and add a tinted gloss for extra sheen. Lips are the only place for a hint of iridescence. As we age, we tend to lose eyelashes, so they start to look skimpy. Celebrity makeup artist Keira Karlin, who has worked in the entertainment industry for the last 20 years, offers these proven ways to achieve bat-able lashes. “First, try a thickening mascara. My favorite is LashBlast by CoverGirl — your lashes look like falsies but are a lot more comfortable,” says Karlin. “Another cult favorite is Dior Show — but if you’re looking to save some dough, L’Oreal Voluminous in Carbon Black is virtually the same thing.” Both LashBlast and Voluminous are about $8.00 in drugstores. If using a thickening mascara still leaves you with wimpy, skimpy lashes, Karlin suggests a base coat or a lash primer underneath your mascara. “Lash primers can sometimes leave your lashes gloppy; my go-to primers are Dior and Kanebo,” she says. Use creamy lipstick, not matte. Matte lipstick doesn’t have enough moisture content and settles into your lip lines, making them stand out. Avoid browns and red with orange undertones. Instead, stick to true/blue reds. Orange lipstick makes teeth look yellow, and brown lipstick can age you. Switch from black to brown. If you have been using black eyeliner for years, it’s time to switch to brown or brown/black. Jet-black liner is too harsh. Use a powder eyeliner or soft pencil rather than liquid. Don’t overpluck your eyebrows. The natural look is in, and as you age, your brows are less likely to grow back in form if you overpluck. Fill in sparse brows for more definition as necessary, but don’t make them look drawn on. Learn how to conceal dark circles under eyes, disguise bags and hide blemishes on any skin tone. Is your hair making you look old?